The CV series consists of non-isolated DC/DC converters that can deliver up to 3A of output current in a small open frame package. This series features remote on/off, adjustable output voltage, and efficiency up to 95%. 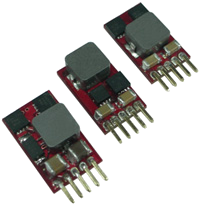 These converters are protected against over current, over temperature, and short circuit conditions. The CV series is RoHS compliant and has UL60950-1, EN60950-1, and IEC60950-1 safety approvals. This series also has positive and negative output applications as well as vertical (standard) and horizontal (“A” suffix) SIP mounting options. Notes: 1. MTBF: BELLCORE TR-NWT-000332. Case 1: 50% Stress, Temperature at 40°C. (Ground, Benign, controlled environment). 2. Output voltage programmable from 0.6V to 3.3V, 0.59V to 6.0V, 3.0V to 6.0V, and 5.0V to 15V by connecting a single resistor between the TRIM and GND pins of the module. To calculate the value of the resistor (Rtrim) for a particular output voltage (Vo), use the equations shown on the data sheet. 3. CV12S3.3-3000: When Vo, set < 0.9VDC the input voltage range is 4.5~9VDC. 4. CV12S3.3-3000: When using negative output application IVoI trim up > 3.3V and the output current is 1.5A max. 5. An external π filter is recommended at the input of the module in order to minimize input reflected ripple. 6. The On/Off control pin voltage is referenced to GND. 7. 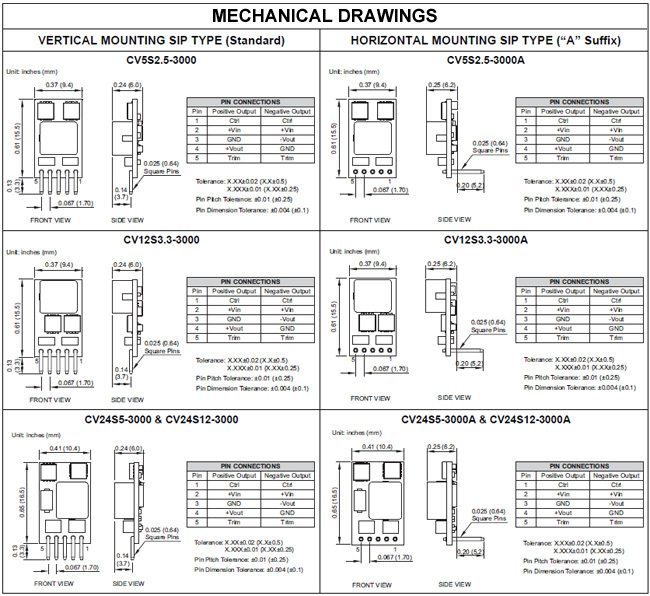 Both vertical mounting and horizontal mounting SIP types are available. Add the suffix “A” to the model number for horizontal mounting SIP type. 8. CAUTION: This power module is not internally fused. An input line fuse must always be used.